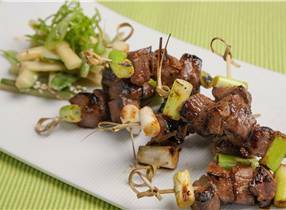 Thread the venison pieces onto pre-soaked bamboo skewers with a piece of spring onion either end.Place onto a flat dish. Mix marinade ingredients together and pour over the skewers. Leave the skewers to marinate for 20 minutes. Remove the venison skewers from the marinade, reserving the remaining liquid to use later.